Join me and let’s Get you started on Your 21 Day Challenge | How to Attract everything you Want in Your Life. 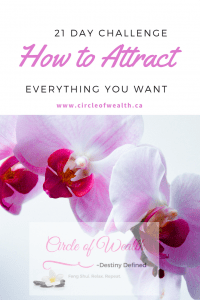 You will get 21 Days of Little Challenges that you can implement to help you attract whatever it is you are looking to Manifest into your life. It’s a video series, sent to you via email, that I share with you about my personal experiences and challenges and reminders with Tips along the way.